Please take a moment to review our tasting notes and selections for food pairings. 2007—What a year to being production! A warm dry summer was followed by an exceptionally dry and long fall. 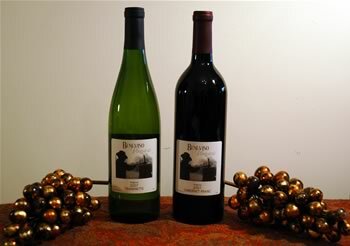 Benevino Vineyards wines are selected for their food friendliness. 2008—A challenging year throughout the state. A cool, wet summer left many grapes unripe—fat and fleshy, but not concentrated in taste or aroma. We went through our vineyards three times to thin and position shoots, dropped fruit twice, and waited later than normal to pick. 2009—We hope this represents a return to more normal growing seasons as global warming expresses itself. A nice warm summer, nearly as hot as 2007, but the driest growing season in 10 years, enabled grapes to ripen completely and fully express their varietal characteristics. Riesling is the great grape of Germany, noted up and down the steep banks of the Mosel and Rhine Rivers. It is known for its floral aroma and high acidity. Our Riesling is varietally pure, as it doesn’t undergo oak aging or malolactic fermentation. In this way, we think you taste the characteristics of the grape, rather than its aging container. Riesling is very expressive of its terroir. Grown in our limestone soils, it shows elegance with a citrus aroma and tropical flavors with tart acidity. In order to balance that acidity (which generates freshness and leads to longer life), it is finished semi-dry. This wine is delicate with perfumed aromas, medium in body, well balanced, and filled with peaches and green apples that are crisp with fresh acidity. This wine is reminiscent of a medium-dry Alsace Riesling. It pairs well with stemmed tree fruit, but is equally delicious with spicier Asian food, stronger cheeses, or a variety of light-flavored meats and seafood dishes. Our prior Rieslings quickly sold out, so check it out early in the season. This is the father of Cabernet Sauvignon, not its stepson. Cabernet Franc is one of the three principal grapes of the Bordeaux region of France, arguably the greatest wine region in the world. Grown on our limestone soil, Cabernet Franc routinely ripens clean fruit in Virginia’s humid summers and survives our alternating cold-with-warm-spell winters. With a full mouthfeel, black pepper spice, and sustained finish, it minimizes the tannins that many drinkers find overwhelming in over-oaked, over-ripe wines. Enjoy our Cabernet Franc with aged cheeses, beef, duck, game, other red meats, and chocolate. The wine is violet red in color with blackberry and ripe plum aromas. Intense, with great body, and complex velvety finish with ripe tannins mixed with essences of vanilla, that is provided by six months of aging in oak barrels. This vintage should age nicely for several years. This year will probably be recognized as the once-in-a-decade vintage for Virginia red wines, so buy several bottles and stock them away for aging. This is a young wine, so give it time to air out or decant, and you will be rewarded with nice earthy aromas. A pleasant combination of tight tannins with notes of black fruit and a lingering finish. Enjoy it with your favorite red meat.